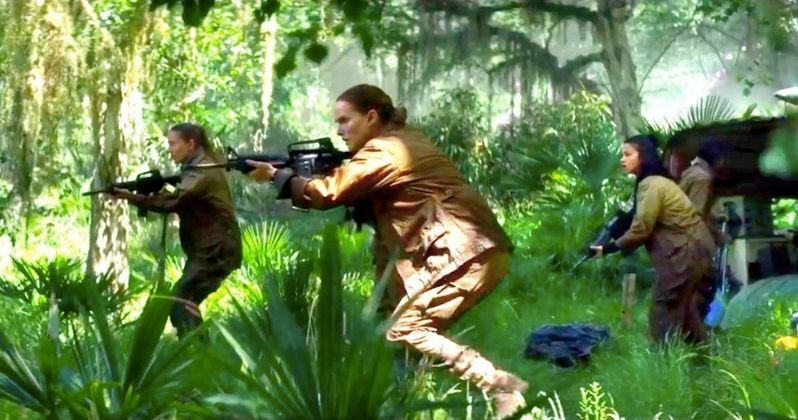 Paramount Pictures has just released the first trailer for Annihilation, following a first look at Natalie Portman's character Lena released yesterday. That photo showcased Lena examining a bizarre albino alligator, which is certainly unusual, but that's just the tip of the iceberg when it comes to the oddities Lena will find in this mysterious place. Whether or not Lena finds what she's looking for remains to be seen, but this trailer shows that this film will certainly give fans a unique experience. The trailer debuted on Paramount Pictures YouTube earlier today, and it's possible that the first poster could be just around the corner as well. The film is based on Jeff VanderMeer's best-selling Southern Reach Trilogy, with this film based on his first book in the series, 2014's Annihilation, which is followed by Authority and Acceptance. Director Alex Garland revealed in an interview yesterday that he has no specific plans to direct the entire trilogy, since he made this film as a stand-alone story, since he already had a bad experience trying to plan out a trilogy with Dredd, which didn't work out so great. Alex Garland (Ex Machina, 28 Days Later) directs from his own screenplay, based on the Jeff VanderMeer best-selling sci-fi novel. Paramount has set a February 23, 2018 release date for Annihilation, which will go up against The War With Grandpa from The Weinstein Company and CBS Films' horror film Winchester. It will also come just a week after Marvel's highly-anticipated Black Panther, along with Lionsgate's Early Man and Pure Flix's Samson on February 16, 2018, and a week before 20th Century Fox's Red Sparrow, Warner Bros.' Game Night and Sony's Alpha. Take a look at the new trailer for Annihliation below.